Spotted! 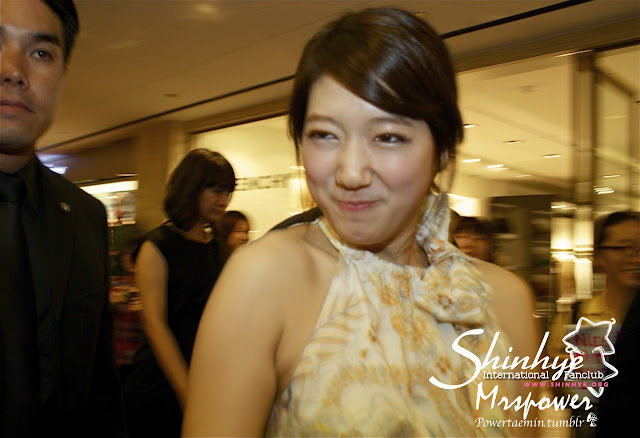 Our star Shin Hye at Salvatore Ferragamo's Spring/Summer 2011 fashion show! The fashion show was held at 8:30pm at Paragon Atrium, Singapore tonight. Shin Hye was invitied as an exclusive VIP guest. She arrived at 8pm, had an interview inside the new Ferragamo store and went to the fashion show. After the show, she had another interview with the CEOs in English. Park Shin Hye was wearing a one-piece summer dress by Salvotore Ferragamo. Special thanks to MRSPOWER for the photos! And to all Singapore fans, esp Oiccia! Special thanks to Jane, Oiccia and MRSPower and for these wonderful photos!! PLEASE DO NOT HOTLINK THE PHOTOS!! Thanks! More photos will be updated soon! Please check back for more tonight and tomorrow! Thanks for the updates Karen..was excited to see pics of her the whole day. Thank you MSSPOWER for sharing the pics...to all SIN fans :) Thanks! Thanks for all the updates. Its a heart warming to see that Shinhye really enjoyed the event. Hope she has developed a liking for Singapore too!^^ Heart felt thanks for all the pictures and videos! You guys really did it tonight! She's sooooooooo BEAUTIFUL!!! The summer dress fits her perfectly. Stunning and gorgeous!! Thank you everyone for all your lovely photos!!! Thanks for all the updates..
love the pictures! and love the dress ~ very youthful and unique ~ so her age. very simple with no accessories, too, except for the orange (?) watch. thanks so much to all the Singaporean fans and affiliates who have entrusted us with their photos and vids. =) daebak! She's good in English!! Absolutely stunning. Love the whole ensemble and the simplicity of her dress yet still sooo beautiful! Thanks again to our affiliates!!! Thank you Karren and to all the contributors of the pictures and videos. I super love her look in this event. Very simple and refreshing. @Kristine: me, too..i'm proud of Shin Hye when I saw her chatting with the CEO... means she understands English... hope she learns some more and speak it more often.